The USS Boxer, was a "Essex" class -or "Ticonderoga" according to other sources-, built at Newport News, Virginia. Commissioned in April 1945, she did not participated in World War II, but was actively employed in the Pacific during the Post-War years. When Boxer just returned from her third deployment, the Korean War broke out and the ship was deployed to zone in a record Pacific transit during July. Then was quickly outfitted for combat service and spent September and October 1950 providing air support for United Nations forces fighting ashore. Boxer made three more Korean War cruises, in March-October 1951, March-September 1952 and May-November 1953. Following her last Korean deployment, which extended into the post-Armistice period, Boxer served as a Seventh Fleet attack carrier (CVA) on two more cruises, in 1954 and in 1955-56. Converted to an anti-submarine warfare aircraft carrier (CVS) in early 1956, she made a final Western Pacific tour in that role during 1956-57. 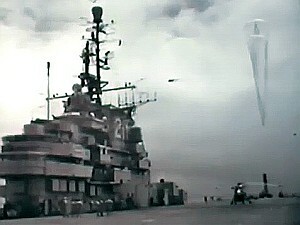 Later in 1957, Boxer operated briefly as an experimental assault helicopter aircraft carrier, an indication of things to come for her, the Navy and the Marine Corps. In 1958, she was flagship for Operation "Hardtack", a nuclear weapons test program in the Central Pacific. In that Operation served as sea base to launch stratospheric balloons. The first launches were carried between early March to late April with the aim to test different systems and to rehearsal launch procedures for the hot test. Finally on April 28 took place the final launch that carried the nuclear device which was detonated in the stratosphere under the code name "YUCCA". That was the only and last time when this kind of activities where carried out using free balloons. After the Pacific deployment, that year the Boxer was transferred to the Atlantic Fleet as an "interim amphibious assault ship" and was formally redesignated LPH-4 on 30 January 1959. For the next decade, she was a vital components of the US amphibious warfare capabilities, operating mainly in the Caribbean area, and including participation in the 1962 Cuban Missile Crisis and the 1965 Dominican Republic intervention. After serving as a spacecraft recovery vessel in early 1966, and two trips to Vietnam, Boxer was decommissioned in December 1969 and was sold for scrapping in February 1971.